Pompey maintained their unbeaten start to the League One campaign with a 0-0 draw at Doncaster on Saturday. Kenny Jackett’s men were under siege in the first half at the Keepmoat Stadium, but improved after the break and came close to scoring through Gareth Evans and Ronan Curtis. 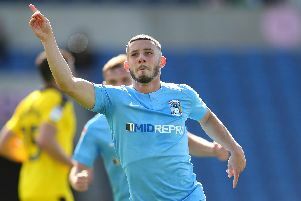 There were several talking points that came out of the game – the biggest being Conor Chaplin not making the trip to South Yorkshire as he wasn’t in the right frame of mind. An average of 10 points from every 5 games will get us promoted and an average of 9 will get us in the play offs. If Chaplin doesn’t get a move by Friday then I doubt he’ll play again for the club. One thing you won’t get away with Pompey fans is a bad attitude! If an average of 2 points per game gets you promoted. Pompey are 3 points ahead of schedule. 4 wins and 1 draw in our opening 5 still a very impressive start!